These are an absolute must-have, ColourVue Glow Green contacts will make your eyes shine! Quarterly replacement contact lenses. ColourVue Glow Green contact lenses are something more than just green crazy contact lenses. 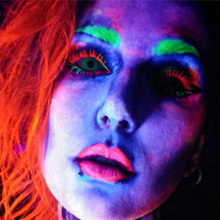 They glow in the UV light making you look like a wild cat staring in the dark! Their bright green color makes them perfect not only for clubbing but also for other kinds of parties, where the UV light is not available - they will still make a big impression on your friends.